Or your search engine will match some of the products, but it won’t be able to return all the products that are relevant for the search term. Since you cannot expect your shoppers to learn how you name the products in your store, you need a way to find out what your customers intend to purchase when they search for certain terms and setup synonyms, so the shopper can find what they’re looking for; regardless if it matches the way you name your products. Synonym management can be a time consuming and never ending exercise, so we created tools that make this task much more efficient. What makes the synonym management problem so hard? Prioritization: there are 10s or 100s of thousands different search terms that shoppers are searching on your website, so it is nearly impossible to set up synonyms for all of them. Prefixbox offers smart tools that help you identify the search terms that have the biggest impact on the quality of your search. Finding the right synonyms: it can take a long time to decipher what a user intends to find when they search for a certain term. By checking analytics for search terms, you can quickly see the relationships between the term and product during a user’s journey, which helps you clarify the intent behind the search term. Prefixbox’s Synonym Management provides predictive tools that suggest relevant synonyms for products and keywords to make this task quicker and easier. Why is synonym management so important? Adding synonyms to keywords and products helps increase the relevant result count for different search queries, which helps shoppers find what they want to buy. It also lets you set antonyms in order to eliminate irrelevant results. A search term may only return 3 results even though you sell more products that match the search intent (these products are most likely named differently), which means shoppers aren’t seeing all your options and you’re losing sales. By adding synonyms you can increase the result count for the same query to, say, 8 or even 22 products. Prefixbox provides detailed analytics about synonyms. You can find information about how cart value, clicks/search, engagement/search change for searched keywords once you add synonyms. This helps you identify how impactful synonyms are and measure the ROI of your work. The diagram below illustrates how CTR for a search term improved over time as synonyms were added. What’s the difference between keyword and product synonyms? Keyword synonyms are synonyms set up for search keywords on your site. For example, if someone searches for “notebook”, you can set “laptop” as a synonymous keyword. Product synonyms work when you set a keyword as a synonym for a specific product. This lets you promote certain products by making them more discoverable by adding them to different search terms, which increases their visibility. This also increases the search result count for certain keywords. Through the Search Analytics views: this is typically used when you are analyzing popular keywords and you see opportunities to increase the CTR or to fix a search term that currently returns 0-results. Through the Synonym Management menu item: when you want to allocate more time to making search improvements via synonym management. Setting up synonyms can be overwhelming and, oftentimes, hard to decide where to begin. When you’re getting started, you should look at commonly searches queries that have a low CTR as these are the most damaging to your business. This can be a long list, but you need to start somewhere. 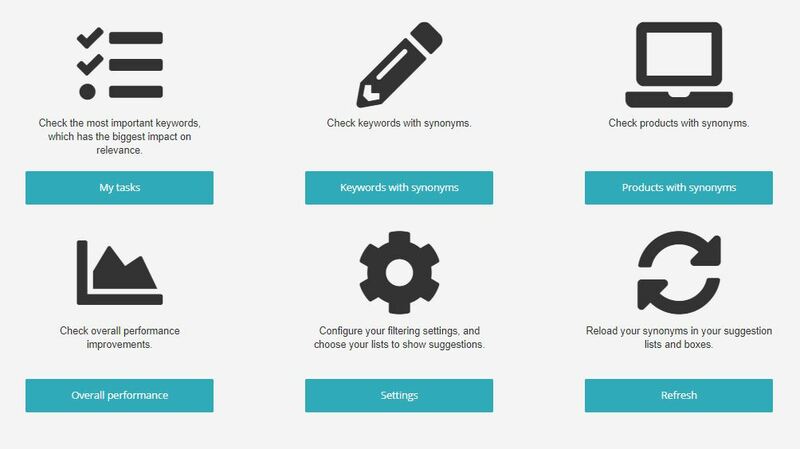 Prefixbox’s synonym management tool can recommend which keywords you work on first. We calculate these suggestions by looking at how often people search for a term and end up clicking on another search term via the Related Keywords widget, products on the SERP, or adding another product to their cart. For example, you can filter all your search keywords based on click-through rate. Here, you can see a sample of keywords filtered with a CTR <30%, which would be a good place to start adding synonyms. For example, if people often search for “phone” and end up clicking on a specific iPhone or adding it to their cart, this will become a suggested synonym. These suggestions are automatically mined from search logs. If users search for term “x”, don’t click on a product and then search for term “y”, the system will start to recognize these as synonymous pairs. There are also synonyms mined from shoppers’ click behavior. For example, this happens when someone is on a search result page and clicks on a product suggested in the Related Products widget on the SERP of 0-results page. If you would like to add more to the “to work on” list, you can also sort through the search term database by setting your own filters. You can filter all your search terms to those that, for example, return fewer than 2 results or those that have low engagement. These features help you get organized and quickly fix the most urgent synonyms on your page to start boosting on-site search conversion rates. This list can sometimes be long, so you can narrow it down by filtering for engagement/search, click-through rate (CTR), or result count. When you’re adding keyword synonyms, you can choose to make them bi-directional (this is not automatic), which applies the match in both directions. For example, is you set “b” as a synonym to “a”, you can select to make this bi-directional in which case “a” will also be a synonym to “b”. You also can set antonyms, which is useful when a search keyword is either returning bad results or too many results. You can find these by filtering your search keywords to those that have a low CTR and set keywords, present in certain product names, as antonyms. For example, if “wood” is the keyword, you can set “wooden door” as an antonym. When setting antonyms, be sure to see which products people are buying, or clicking on, for each keyword so you don’t negate your most popular products! You can find this on the “search term daily analytics” page (top clicks, top carts). Setting product synonyms increases the number of search results for certain queries and it also provides a way for you to promote certain products. For example, if you’re selling a luxury vacation for 2, you can set this product as a synonym for queries like “honeymoon” or “wedding anniversary”. By setting a product as a synonym for more keywords, you increase the number of times it’s displayed and in turn promote it to more customers. This works by adding a product as a synonym for a keyword, which must be done one by one. However, there is a tool for this that also provides suggestions. In this way, adding product synonyms is much more precise than adding keyword synonyms. Prefixbox will automatically recommend products to add as synonyms, the same way it does for keyword synonyms. These are set up the same way as keyword synonyms. However, you can’t add antonyms. When setting up synonyms for keywords you can turn on fuzzy search, however you have to do this individually for every keyword where it is needed. Fuzzy searching finds results that approximately match the initial query, but not exactly. Because of this, it can occasionally make mistakes and return irrelevant results. So, depending on how exact you want your results, you can turn this on/off. We usually recommend having fuzzy search on as the default, but this can sometimes lead to incorrect results. By turning it off, you will avoid these errors. Prefixbox also offers category management tools that also help you boost products and refine results shown for specific keywords. If a customer on your site enters a specific query, let’s say “Barbie”. Then clicks on a Barbie product in the “Children’s Toys” category on your site, “Children’s Toys” will become a suggested category for “Barbie”. If you decide to add this as a category, you can then include “Barbie” in this category, which will increase the number of times this product shows up and, in turn, boost sales. You can also select an option to boost this match, which will make the products that match the “Barbie” keyword in the “Children’s Toys” category show up closer to the top of the SERP. In order to do this, you need to turn this option on. On the flip side, you can choose to exclude “Barbie” from this category – this is useful if your search engine is returning a lot of results and you have a low click through rate. This is a sign you should show fewer, more relevant results. Prefixbox drastically improves eCommerce search efficiency to boost product purchases and to create a better search experience.